The necklace has been sent to Cristina, however, I have not received any response from Ruth yet. If I don't hear from her until 24 March 2014, I am going to announce a new winner. I received a reply from Ruth on the last day before I was to announce the new winner, so all good, Ruth is already wearing her new coat. I have been blogging for a few months now, so I decided that it's time to have the first giveaway on my blog. I tried to do a giveaway on Twitter and on Google+ just as an experiment, but I had no success, so I decided to incorporate my prize (the necklace) into this giveaway instead. Nevertheless, a few people that did enter before are automatically included into this giveaway, so you don't need to enter again. 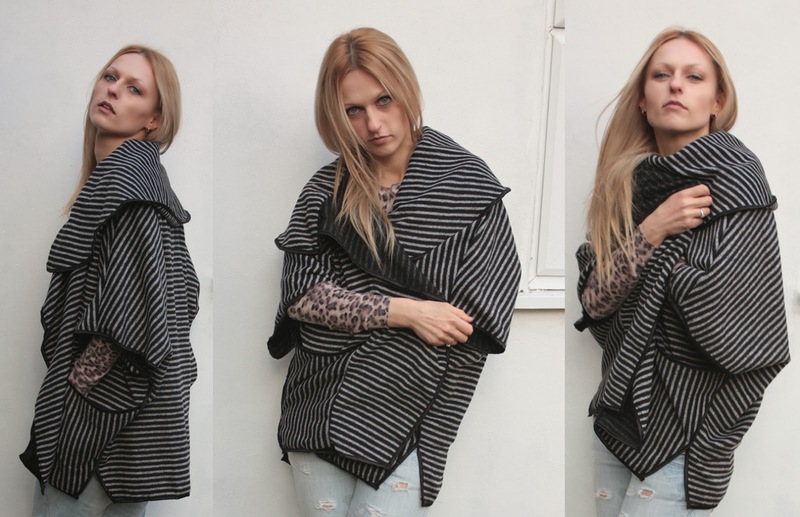 The first person that I am going to pick randomly is going to win a Sammydress stripe colour block cowl neck bat-wing sleeves loose-fitting style coat. It's the coat that you can see in the pictures below. Although I was wearing one for the photos, I have another one unopened for the winner. The coat is not a winter coat, but it is fairly warm and it is suitable for anyone. It's one size fits all. The quality is brilliant. The material is thick and warm, but very soft. It's too cold in the UK to wear this coat outdoors right now, but I can't wait for spring to show it off. The second prize is a funky necklace that I bought in a local shop near where I live. I absolutely love the necklace, but I have not worn it as I bought it as a prize for the winner from myself. This giveaway is going to end on the 11th of March, regardless of the number of entrants and its success. I will notify the winner through social media sites or through your e-mail address if provided. Please visit Sammydress.com, browse around and leave the full name of any product that you like in the comment below. 'Like' my Facebook page and any one of my posts. If you are already 'liking' my Facebook page, then 'like' two posts instead. Also leave your name that you are using on Facebook in the comment below, so that I can identify you. Here is the link to my Facebook page. I am NOT asking you to leave your e-mail address, but if you think I am going to struggle to contact you through social media sites, please leave your e-mail address in the comment too. If I don't know how to contact you, I will pick another winner on the same day. First of all, thank you to Sammydress for providing me and the winner with that beautiful coat. Sammydress is an online shop selling fashion items worldwide. They sell quality products for very low prices that rival Ebay. The company's goal is to provide their global customers with quality items at very low prices. They have a huge range of products with over 200,000 product lines. The items range from clothes, shoes, handbags, jewellery, bags and accessories to home and living, men, children's clothes and toys. Sammydress also provides wholesale prices for professional large buyers. They take customer service seriously and they are working towards eliminating even the most trivial customer dissatisfaction. Have you ever bought anything from Sammydress? What's your experience? What other low price shops do you buy at?